French radio presenter and entrepreneur who became known as host of the Eurovision Song Contest and Nouvelle Star. He's also known for hosting the radio show Planet Arthur and the Morning Live. 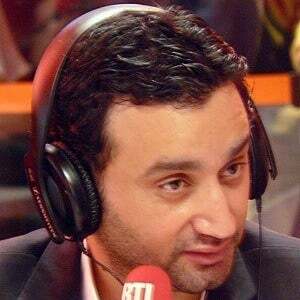 He has his own brand of vodka and perfume as well as founded the fashion line Cyril Hanouna Seduction. He worked numerous odd jobs before making his debut in radio writing lyrics for trailers in 1999. He was ranked #1 on People with Money's list of Top 10 Highest Paid Television Hosts for 2016. He's originally from Paris, France but also has Tunisian origins. He originally wanted to become a doctor like his father. He has hoted Nouvelle Star with judge Manu Katche.